You’re minutes away from getting everything you need to create your own blueprint for success! To reach your professional goals, you need the essential skills necessary for success. 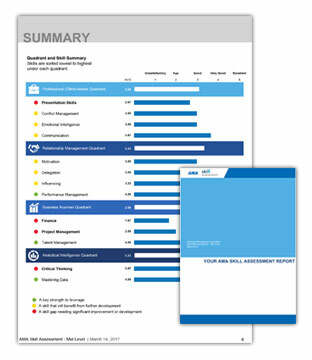 Use AMA’s new FREE tool, the AMA Skill Assessment, to quickly and accurately self-evaluate your current skills based on your professional level. Once completed, you get personalized results on your strengths and skill gaps, plus recommendations for development. © AMA—American Management Association. All rights reserved.